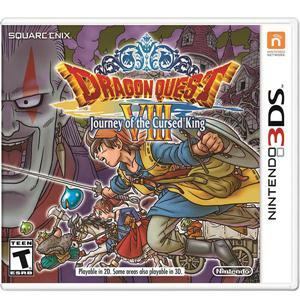 Dragon Quest VIII: Journey of the Cursed King. Uncover the story of the Cursed King as you save the world from a twisted magician in this genre-defining role-playing game. Across the vast world you'll wage turn-based battles against more than 250 monsters designed by famed artist Akira Toriyama. As you level up, upgrade your warriors? skills to learn mighty attacks. Untold possibilities await. After setting off into the unknown, you'll find monsters roaming the field-these are no mere random encounters. There's a satisfying rhythm to traveling, fighting monsters, earning items, crafting something useful with them using an alchemy Pot, and returning to battle, stronger than ever. To some, it's pitch-perfect RPG gameplay, complete with additional content outside the main storyline. In the Monster Arena, you'll form and battle teams of monsters to climb the ranks. It's but one of many features that makes this RPG a classic among classics.